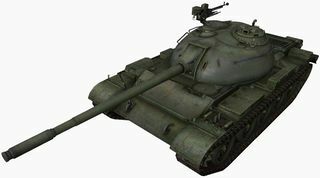 Considered one of the best tier 8 premium tanks, the Type 59 combines thick frontal armor with a reliable gun and excellent mobility. Because of its large spread of features and lack of specialization, the Type 59 fills the 'pocket heavy' role of the tier VIII premiums and very often performs better than expected in 1-on-1 fights with tier VIII mediums and light tanks. 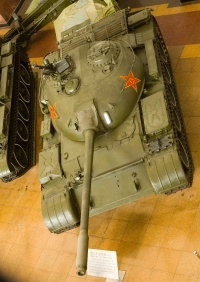 The Type 59's main gun is the same 100 mm cannon found on the T-34-2. Compared to its tier 8 peers, this tank is very well protected. 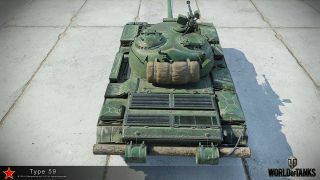 100 mm frontal armor sloped at 60 degrees is strong enough to stop around 175 mm penetration AP rounds and 200 mm HEAT rounds reliably with minimal angling. This is usually enough to protect from Russian 122 mm D-25T and its peers, as well as many guns found on other tier 8 and below mediums. When shooting this tank from the front, it is generally best to aim for the hatches on top of the turret. While the lower plate might at first seem like a nice target, it is actually just as thick as the upper plate, plus it is generally at a more extreme angle, given its low placement. Availability of gold-ammo-for-credits does allow tanks with weaker penetration to have a better hope at combating this tank frontally. 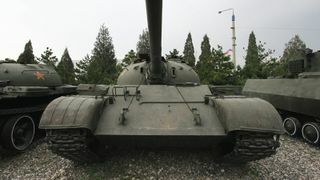 The two cupolas on the turret are technically weakspots, but still feature 150 mm armour at the front, which is both rounded and sloped. Because of the relatively low silhouette it is possible to shoot down into the top armour in front of the turret from close range. This is very thin and can be easily overmatched even at extreme angles. While the Type 59 has many advantages, it does have a few disadvantages. A fuel tank is located next to the driver at the front of the tank, meaning catching fire from a frontal hit is certainly possible. Ammo racks are also located all along the right side of the hull as well. 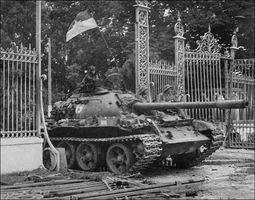 Flanking a type 59 from the right side can often lead to ammo rack damage for this tank, or even the rack itself detonating. 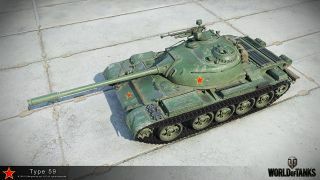 With the release of the patch 9.20.1 it gave the Type 59 a few buffs such as: Decreased aim time from 2.9 to 2.3 seconds, increase of the ammunition capacity from 34 to 50, decreased turret traverse dispersion by 25%, decreased hull traverse dispersion by 22% and when moving the dispersion is decreased by 22%. 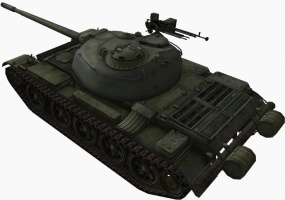 In Patch 1.2, the Type 59 received a much more powerful engine and additional gun handling buffs as well as improved frontal turret armor and slight penetration and RoF increases. 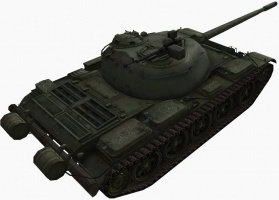 The Type 59 also has a very high credit earning ability, just like the other premium tanks. 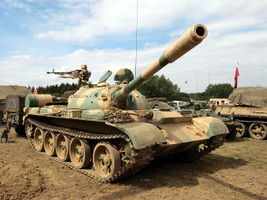 Some even argue that this tank earns the most credits out of the lot due to cheaper ammunition. 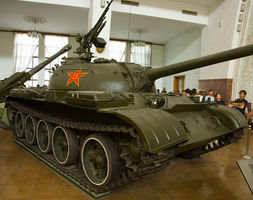 Something to note is that since this tank is now only available as a competition prize, it is very hard to acquire one. 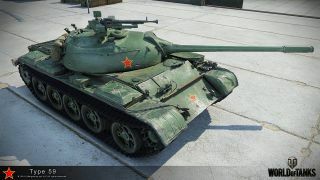 However, the WZ-120 performs similarly to the Type 59, but the main difference between the two is that you can upgrade the WZ-120 (which ends up vastly better), though you will be facing top tier tanks frequently instead of tier 6 or 7s, as well as not be able to earn as many credits while playing it. Equipment Setup: Gun Rammer is mandatory, VStab highly recommended to better utilized its high mobility; 3rd slot can be Coated Optics to boost view range or Vents to improve overall performance. Wet Ammo Rack can be somewhat pointless due to the vehicle's low base module HP: even with both Safe Stowage and Wet Rack applied, 100mm projectiles can still detonate it in 2 shots, and 122mm projectiles highly likely to "yellow" by a single shot all the same; only install if you intend to challenge heavy hitters from time to time. This page was last modified on 26 October 2018, at 15:58. This page has been accessed 802,389 times.